A quick addendum to my earlier post on thrifty cooking: yesterday I noticed that the “4 ingredients” book also has an iPhone App that you can buy for A$4.99. 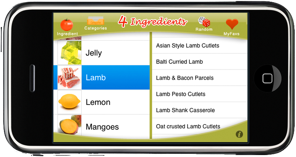 The advantage that the App has over the dead tree version is that you can search for recipes by scrolling through an alphabetical list of ingredients (and although it’s called “ingredients” the list also includes categories too, such as “Breakfast”). It’s also a funny co-incidence is that the App is “rated 4+” (as in the age classification, not the customer ratings).